Do you have what it takes to become Merlin’s sorcery apprentice and stir the cauldron to bring yourself monetary glory. Merlin’s Magic is a 5 reel, 50 payline online slot game packed with magic bonus reels and high-quality animations. Match Merlin’s spellbook and scrolls to earn your place in the enchanted school of free spins and cash rewards. NextGen Gaming is an experienced developer of prosperous slot games for online and land-based markets around worldwide. With almost two decades of experience they are constantly pushing the field into new themes and territories resulting in NextGen Gaming becoming one of the leading innovators in the gambling industry. Anchored by a “NextGen promise” they strive to create games that deliver extraordinary entertainment and quality – with integrity. These assets combined with fully realised characters and tantalising story lines keep this developer at the top of their field. Based on its prequel, Merlin’s Mullions, Merlin’s Magic sees King Arthur’s faithful wizard return in this next magical instalment to the NextGen Gaming portfolio. 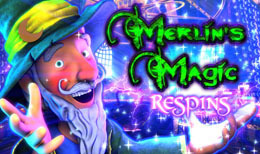 Join Merlin in his mystical tower, filled with potions, spell books and cauldrons as you discover a 5 reel, 50 pay line machine sure to infuse magic in each players gaming experience. Low Win Icons – Low win icons will bring between 5 and 100 credits per winning spin, depending on how many are collected. These include the letters J, Q, K and A as well as the number 10. High Win Icons – Starting at 20 credits and going as high as 500 credits the telescope, magic scroll, spell book and goblet each hold a different value and are some of the player’s main aims during the base game. The Wild – Merlin himself is the representation of the Wild card. Its function is to substitute all symbols besides the Scatter symbol to greatly improve the chances of a winning spin. Merlin can be found on reels 2, 3 and 4. If he appears on all 3 reels the Wild Re-Spin feature will be triggered. The Scatter – Shown as a magic Cauldron the Scatter can appear on reels 2, 3 and 4. If 3 are collected in 1 round the Free Games bonus feature is automatically triggered. Bonus features are another extremely important area of Merlin’s Magic, these rounds allow the player even more ways to win and with a larger potential return. Gamble Option – If a player wins from a spin they then have the choice to risk it all for the potential to double or even quadruple everything won during the round. By selecting the gamble button a hidden card will appear and the player will be asked to either correctly guess the colour or the suit of the card. Correctly guessing the colour will win the player x2 whereas correctly guessing the suit will win the player x4. If the player is wrong all money gambled the round will be lost. Free Games – The collection of 3 Scatters will grant the player x7 free spins. This bonus can be re-triggered. Wild Re-Spins – Unlocked during the SuperBet playing, and during this round, any new stack of Wilds award the player additional re-spins. The number is directly linked to the level of the SuperBet amount (up to 5 levels). This online slot truly shows off the superior high-quality graphics, storytelling and exciting sound effects that NextGen Gaming have become known for over the span of their career, combined with the return of a well-loved character this game is sure to attract both fans of the original Merlin’s Millions game as well as the loyal following of NextGen Gaming.